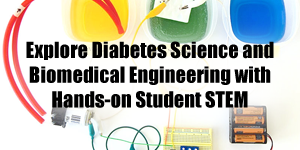 If you have diabetes or know someone who does, you may be especially interested in doing a science project that explores a specific angle of diabetes. From the data you may be collecting with your continuous glucose monitor and carb counting to the ways in which factors like exercise affect blood glucose to technology and engineering related to diabetes tools and devices, there are all kinds of exciting projects you can explore. How Many Sugars in a Smoothie? 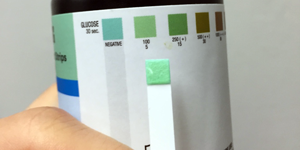 Use a color-change test to see the concentration of glucose in fruits and juices. Why do some ingredients cause less of a rise in blood sugar than others? What does digestion have to do with how much glucose we absorb from different foods? Adapt this project to compare the impact of different sugar substitutes on blood sugar. Use a model to investigate how a person's genetics affect their chances of getting Type 1 Diabetes. Investigate how blood glucose levels change with exercise and how the effect may vary person to person. Electrolytes are important for all athletes. How do different sugar-free electrolyte drinks compare? Can you create a diabetes-related project based on wearing a fitness tracker? Why Aren't All Medicines Pills? 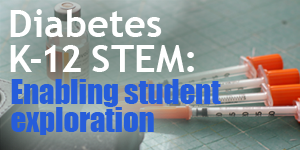 Build a model of an artificial pancreas and explore the challenges involved in this kind of system. Make it your own! What kind of reminder app might help a person with diabetes? Use jello shapes to model insulin and explore why some medicines work in pill form and others do not. Adapt this project to create a game that teaches about diabetes. See also: An Ocean-Friendly Fishing Video Game.